In the last post of this series, I established my working gauge for this project. I’ll now try and convert the numbers given by the pattern in order to adapt them to my gauge. Truth be told, I sometimes wonder why I chose a craft involving so much calculations when I used to hate algebra in high school. Anyway, there’s no escaping it : let’s do some math ! I have a gauge of 3 stitches and 4 rows per centimeter, which means it should be 30 stitches and 40 rows per 10 centimeters (or 4 inches). The pattern calls for (gasp) 17 stitches and 22 rows per 10 centimeters/4 inches. That’s almost (but not quite, that would be too easy) half my numbers. It means that to get the correct numbers of stitches for my yarn, I have to multiply the given stitch numbers by, roughly, 1,75 (figure obtained by dividing gauge stitch/10cm number, here 30, by pattern stitch/10cm number, here 17) and the given row numbers by, roughly, 1,8 (again, figure obtained by dividing gauge row/10cm number, here 40, by pattern row/10cm number, here 22). The instructions say to begin with yoke by casting on 58 stitches. I’ll cast on 58 x 1,75 = 101 stitches (the result actually is 101,5 stitches but I’ll choose to go with the smaller figure every time because the design already has a lot of positive ease). Given the nature of the yoke (raised by short-rows in the back and featuring seven repeats of a lace pattern), the next thing I’ll need to to before going further is to figure out how to treat the lace, or more exactly, how many stitches will be needed at the beginning of the lace pattern to achieve a similar shape and size. I’ll also need to figure out how I’m going to work the yoke increases. That means not only more calculations, but also, unavoidably, some charting and some more swatching to see how it works (due to scarcity of yarn, I totally plan on not blocking that swatch and on unraveling it as soon as it has fulfilled its purpose). There are 7 lace repeats. 7 x 15 = 105. This means I’ll had to increase 4 stitches at the bottom of the collar to fit the 7 repeats in. Now, the original lace pattern begins with increasing 9 times, every second row, by adding yarn overs on each side of the central stitch (the “stem”). To achieve the same width, I’ll need to increase 9 x 1,75 = 15,75 times. Let’s say 15 (because, again, that design has lots of positive ease). These increases will be made over 17 x 1,8 = 30,6 rows. I’ll make that 29 (so that I can increase every second row) and keep in mind that I might want to add one or two more row(s) at the bottom of the yoke. Then, the tip of the leaf is shaped by decreasing 10 times over 19 rows. For me, that will be 16 decreases, every second row, over 31 rows. At the same time as the tip decreases, the yoke width actually increases. The pattern does that by adding 2 times one increase, then 5 times 2 increases, unevenly spaced (of course). I will instead increase 1 stitch 4 times every 4th row, then 2 stitches 9 times (5 times every 4th row, 4 times every 6th row). Now I need to swatch and check it works — that is, wether the leaves keep the right shape and size, and wether the yoke will be wide and long enough (I’m expecting some differences lengthwise because I simply replicated the number of rows between increases of the original pattern instead of calculating new ones ; as I’m rather short, I’m hoping the yoke will fit this way. If not, I’ll have to space the increases differently). Here’s the swatch, roughly pinned for photo purposes. It helped me determine two things : 1. the measurements seem to match those indicated by the pattern ; 2. 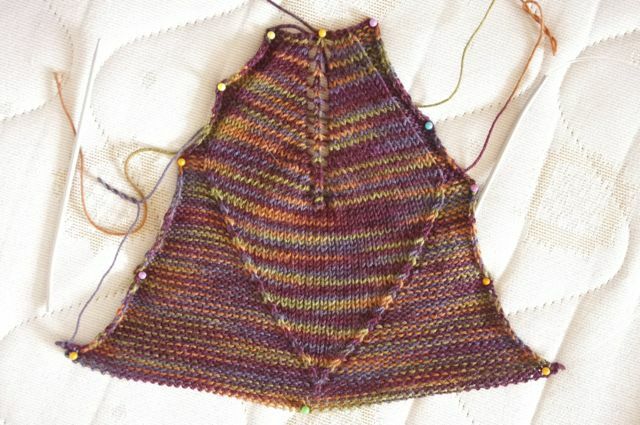 I won’t be knitting the yoke with the variegated, but with the solid yarn, and simply stripe the main body and sleeves. I haven’t worked out yet how to knit the short rows used to raise the back of the neck. That’s because it’s one of the things I do better with yarn and needles in hand. So, the next step will be to actually cast on that tunic ! This entry was posted in Knitting and tagged adapting a pattern, lace by Julie Paik. Bookmark the permalink.